Please click the link below to visit the new DarqUI v2.1 page which includes a new update for this window. Thank you for using the DarqUI interface pieces. Potion cure item numbers have been updated to match the new current tier potions. This is an incremental update only. Features in development will be published later as version 1.4 to correspond with the new group and raid window version 1.4 releases. Please take a few minutes to read through the help file included with the download. It contains extensive instructions and advice for getting the most out of this interface piece. Audible Personal Detrimentals. New interface controls provide you with instant audible feedback when selected impairments land on you. Choices can be customized on-the-fly so you can re-combine as needed for each encounter. Allows you to respond more freely to other gameplay elements without constantly watching your detrimentals during difficult encounters. Text Channel Announcements. This feature was designed primarily for impairment feedback into raid healer channels, although all classes and playstyles can benefit. Delivers targeted text into raidsay or the chat channel of your choice each time a monitored impairment lands on you, increases in quantity, or gets cured/worn off. Channel name and command can be adjusted on-the-fly in the options panel. Send a test string into the channel informing healers which combination of your impairments you will be monitoring. Switch text monitoring on and off for each detrimental type with a single click. Cancel Spellcast has been added to the options panel. An implied target health bar was added, handy for any class to watch the health of the enemy or whoever currently has aggro. Click the bar to change focus to your target's target, be it friend or foe. This lets you switch reliably between the tank and his current enemy during encounters. Visibility of the health bar can be turned on and off from the options panel. Version 1.1: Cure Check feature now prevents using a potion when the detrimental is uncurable. This threat window is actually a composite of several game functions. It was designed from a tank's perspective to bring together information from several places on screen, but all classes can benefit from it. The flames have been replaced by two superimposed bars, a red one for aggro and a yellow one for secondary threat. The large red and yellow numbers are still there, but the bars give you a very graphical idea of relative hate. Your current target's name, health bar and health percent appear over the threat bars. The name of whoever has aggro goes below the bars (unless you have aggro, then it's empty. This mirrors the function of the implied target window.) 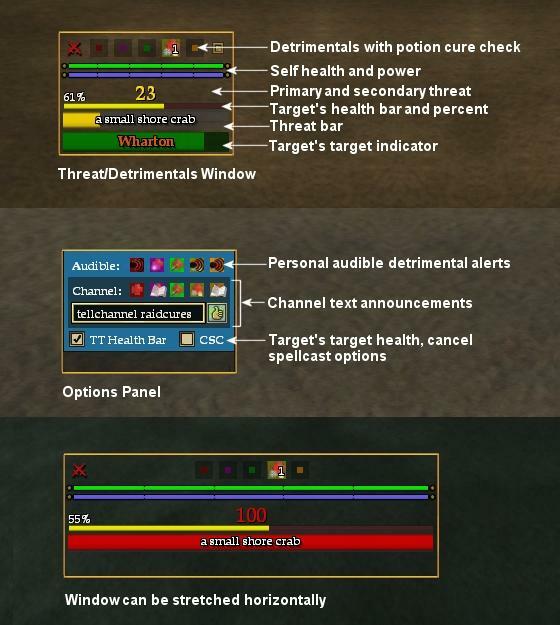 Your own health and mana are above the threat area, again consolidating important combat info from other windows into one spot on the screen. 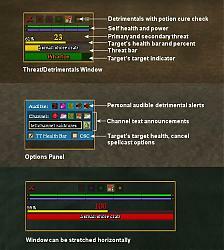 Your detrimentals appear on five buttons at the top, and current-tier potions (Dedicated Remedies) are tied to these buttons similar to click-to-cure spells. These buttons use a feature I call Cure Check, which means if the detrimental you click is not actually on you at the moment you click, the potion won't be consumed. This has already saved me a lot of potions, and more importantly it saves the wasted cooldown time so you're ready for the next detrimental immediately. The cure check also lets you pre-spam a cure potion in certain encounters without consuming the potion until the detrimental actually lands. Since there is no Curse cure potion, the curse icon sends "CURSED" text into groupsay and raidsay when you click it, again checking first to see if you actually have a curse on you. This could be synchronized with ACT sound triggers for added efficiency. I hope you enjoy using this mod. If you like this window, be sure to check out my Raid and Group windows with real spell icons and click-to-cure buttons that use the Cure Check feature, and my Clock/Countdown Timer window also on EQ2Interface.com. Tinypackages, are you playing the standard or free-to-play version of the game? There may be some file differences between the versions, although I'd be surprised if the UI files are affected. With the standard subscription, the default files will get automatically checked and re-downloaded if necessary every time you load the game. Last edited by Darqwood : 10-04-2010 at 06:15 PM. Both of those files should be in your Everquest II\UI\Default\images folder. Hello I was looking for a new threat meter and saw this one. However after looking at the xml I saw 2 files it calls for which I do not have. Not in my UI or the Sony Default UI folder. They are : map_symb.dds and window_elements_tradeskill.dds where can I get them? If i press to cure myself my target changes from the mob to me and doesnt change back. Last edited by silverheals : 06-18-2010 at 07:09 PM. When I cure myself w a potion I change targets- anyway to change that so I don't change targets? Hi, silverheals. Can you give me an example of what your target was before clicking the cure, and what your target was afterward? I am unable to get version 1.31 to work. It keeps saying "You may only use items in your inventory". I have 100 of each focused remedies in my bags but its like it doesnt see them. I can hotbar them and use them just fine. Terenze, you've done everything right except due to the way the game works, you must store all of your Focused remedies in your character's inventory. Try putting all of your spare remedies into your bags from the bank, vault, broker, shared bank, anyplace they may be besides inventory and then try to use one. It should work this time. Is there a way to also have it use spells instead of just potions? Yes jehcan, that's one's of the upgrades in development. Thanks for being patient, I'll get the new version published as soon as I can. anyway you could make it compatible with profit? rolalinii, you should be able to drop the threat window into your ProfitUI folder and begin using it without any compatibility issues. Remember to save the existing threat window first in case you want to switch back. Darqwood, thanks for the great threat window! Its very useful! Last edited by vanq : 02-25-2010 at 05:29 PM.